It has been one week since sweet smokey smells of bacon wafted through Liberty Station. 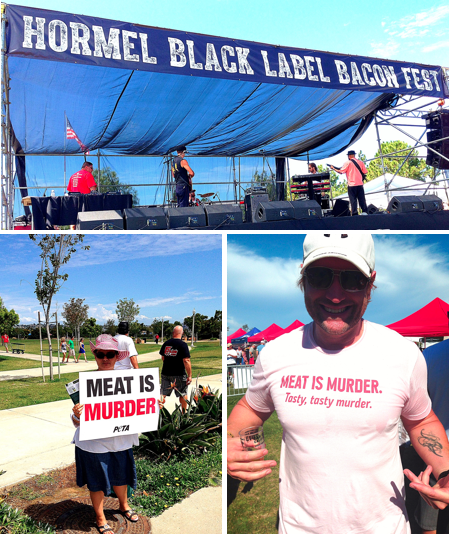 The Inaugural Hormel Black Label Bacon Fest was organized to honor National Bacon Day, and that it did, as some of the best chefs, breweries, wineries and spirits manufacturers joined other vendors and a sold-out crowd of swine belly enthusiasts for a day of celebrating America's favorite meat product. Well, not everyone's favorite - animals rights activists and other PETA protestors lined the walkway into the event, forming an ironic 'welcoming party' boasting signs meant to shame festival goers for their participation in the gluttonous display. Though I always love seeing citizens exercising their First Amendment, it only made me hungrier. After all, meat is murder; tasty, tasty murder. (credit to this guy's shirt ---->). We were fortunate enough to have VIP tickets to the first-ever San Diego Bacon Fest, which granted us an hour of early admission, as well as a nifty little Brewcaddy necklace for our Bacon Fest souvenir tasting cups. The general admission crowd was already lined up and chomping at the proverbial bit when we arrived (mostly because they can't read start times properly), so we knew we had to make the most of our hour before they busted through those gates. We buzzed about the fest scoring beer samples from the thirty or so breweries in attendance. Ballast Point was one of the most creative offerings, as they were mixing their Habanero infused Sculpin IPA with their own Bloody Mary Mix, which paired perfectly with smokey bacon. We were fixtures at Lagunitas Brewing, as they were pouring their seasonal favorite, Little Sumpin' Wild, which is delicious and hard to come by. Societe Brewing was another favorite, as they offered a whole host of beers, including Harlot and Pupil. The food at Bacon Fest was on another level. Upon entry, Hormel handed out pure form samples of its Black Label Bacon, which was available throughout the festival. Slater's 50/50 maintained its long line throughout the event, as it dished out quarter servings of it's 2/3 pound B'B'B Bacon Burger. Chef Karl Prohaska of the Handlery Hotel killed it with is dirty red dust chicharones - pork belly pieces, smoked for days, fried, then tossed in his secret spice blend and topped with a spicy aioli. Bub's at the Ballbark made delicious little pork belly corn dogs. Sabuku Sushi offered up its BTA and Bacon Avocado rolls. Studio Diner almost seared my palate with its bacon-wrapped jalapenos stuffed with Monterey cheese and cream cheese - a volcanic explosion of creamy goodness with a nice mix of spice and smoke. So many restaurants were in attendance that it was difficult to reach them all, but that didn't stop us from trying. Sure, you negative Nancys, lines got a bit long once the festival reached its apex, but what do you expect when the King of Happy Hour throws a festival centered around bacon? And beer! After all, the festival was sold out and people came ready to gorge. And, as we mentioned, the event was protested by PETA, and while we're all for exercising your rights, it seemed a bit counter-intuitive when you think about all the other food festivals in San Diego throughout the year, most of them cooking up many species of animal. Bacon Fest was only focused on one cut from one animal - one amazing, succulent belly. We had a blast at Bacon Fest and look forward to its revival for many years to come. Check out SDBaconFest.com for a full list of participating vendors, and follow on Facebook and Twitter for up to date information on the second installment.